“The moth that’s smaller than its name” applies to quite a lot of micro moths, though the label “micro moth” doesn’t necessarily mean a moth smaller than one classed as a “macro moth” – you didn’t think it was going to be that simple, did you? However, most micro moths are very small. Out of around 2,500 moths in the UK, only about 900 are classed as macro, so you can see that there are actually more micros than macros. 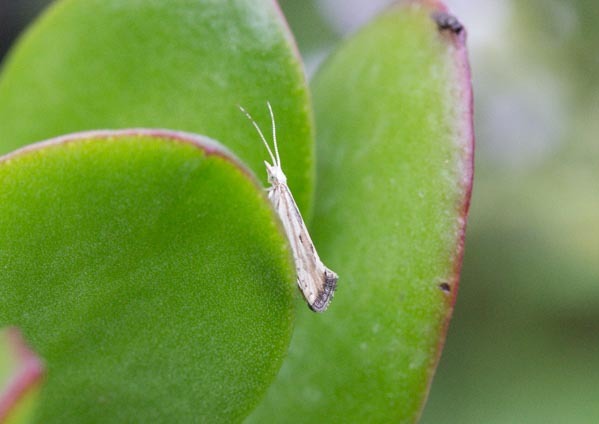 Here I’m talking in particular about plutella porrectella, a micro moth I see in my garden, or more often in my greenhouse: though that might be because it’s easier to see small things on plants at waist level than ground level. Its body is only about 10mm long: in this photo it is on the leaf of a succulent called crassula, having just emerged from its chrysalis. The adult moth is recorded as flying in May and again in July to August, so the fact that I took this photo in October may be due to the good summer helped by the shelter of the greenhouse environment. 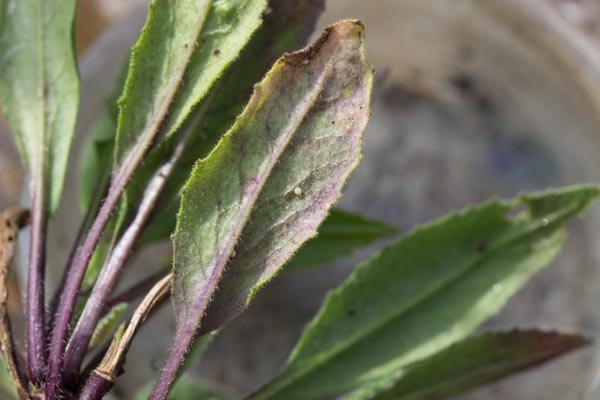 The foodplant eaten by the caterpillars of this moth is one called Sweet Rocket, or Dame’s Violet in the UK: hesperis matronalis to give it it’s Latin name. As someone who grows plants to sell in aid of Butterfly Conservation, I found myself a bit torn a couple of years back when I first encountered this moth by finding that its caterpillars had eaten all my young plants of it! I now try to live and let live by keeping some of the small plants under cover and letting the moths enjoy the bigger ones, which they can’t damage enough to kill. What first drew my attention to it wasn’t the adult moth or its caterpillar, but its chrysalis. 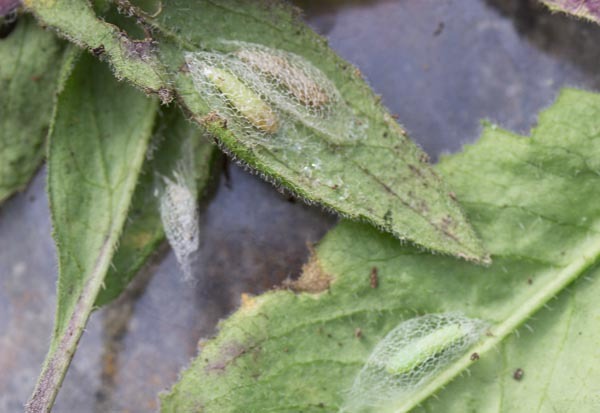 As you can see in the photo below, it is quite distinctive, forming a loose net around the pupa, usually on the back of a leaf. The one on the bottom leaf is a new pupa: it still looks quite like the caterpillar, while the upper ones show the stages it goes through as it changes from green to brown as it develops. You can also see an empty web, where one has hatched. The egg, as you would expect, is also very small: I would not have spotted this one on the underside of a leaf unless I had been looking for it, alerted by the pupae. So – look out for small things on your plants – you never know what they may be! Now we’re into winter, these posts are going to be somewhat sporadic, but they will continue.